Besides being ridiculously overpriced and extremely awkward for the impatient people like me ... here's another reason not to use eHarmony - their email marketing and email affiliate program is out of control. eHarmony pays a HUGE amount for affiliates and so the spammers have been overloading my junkbox for the last two months. 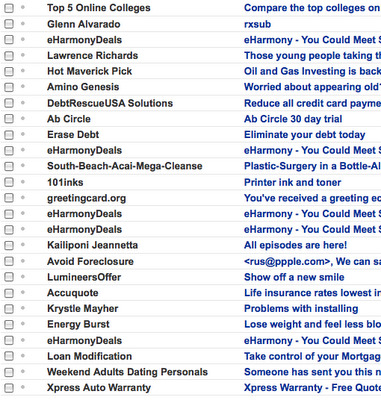 eHarmony should be put to task in the media for sending emails out to married people - even if from an affiliate. One of the things eHarmony prides itself in is not allowing "Married But Looking" matchmaking. Awesome eBay iTems Up For Sale This Week!